Every gardener has an opinion on how to grow tomatoes, and to tell the truth many are right. Its just that some grow better tomatoes than others. 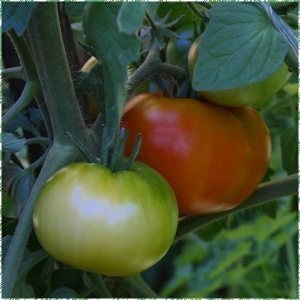 Growing Tomatoes from seed or seedlings in the home garden is fairly simple given appropriate conditions, a humus rich well drained but moist soil and lots of sun. Growing tomatoes from seed is easy, especially if you have a hothouse to start the seeds in. Tomatoes are popular as a home grown plant due to the fantastic flavour that tomatoes grown at home give and to the relative ease that tomatoes are grown. Heirloom tomato varieties are increasing popular for flavour as well as appearance. Do not over water before flowering and fruit set. Wait until plants almost begin to droop before watering. A little stress will bring on flowering and fruit set. Remember that tomatoes are really a fruit, but are treated by many as a vegetable. Tomatoes can easily be grown in containers or in the ground. Tomatoes are suitable for growing hydroponically or in tomato grow bags. Tomatoes can be grown from seed or from seedlings. Growing tomatoes from seed is increasingly popular due to the wide range of heirloom tomato seed varieties available. If you grow your tomatoes from seed it is best to start them in punnets in a warm greenhouse and plant them out in late spring to early summer depending on climate. Most tomatoes require staking. Once the seedlings have reached 15cm high, harden them off and then take the healthiest seedlings for planting in the garden or pots. Once the weather warms up remember to mulch tomatoes well to retain moisture. A minimum of 6 – 8 hours sun a day is best. Tomatoes can be grown in the ground, in pots, or hydroponically. Growing tomatoes in the ground. Prepare the soil in a sunny position, dig in well rotted compost and some cow manure 3 -4 weeks before planting seedlings. Place stakes 24inches apart and the plant seedlings at the base of each stake. Water in well with a liquid fertilizer or compost tea. Pinch off the lower leaves from the seedlings when they are 6 – 8 inches tall. Tie tomato plants to the stake as they grow for support. Avoid fertilizers that high in nitrogen, nitrogen promotes foliage growth, you want fruit, so look for fertilizers that are basically sulphate of potash. We use liquid fertilizers once every two weeks after flowering. Pomodoro San Marzano (San Marzano Tomato) is a favourite variety with Italian Gardeners. Space tomato plants approx 1m apart to promote good airflow and make sure that they receive at least 6 hours of sun each day. Tomatoes need to be staked or grown in a tomato cage, except for those that are grown as hanging tomatoes. Tomato plants like constant but low moisture, do wet and then dry. Fluctuating moisture can cause tomatoes to split. Too much moisture encourages large but flavourless fruit. Tomato plants do not require lots of food to do well, a humus rich well composted soil is best. Tomato seedlings seem to become available for sale earlier every year, so what is the best time to plant ? Forget those really early offerings from nurseries, if you plant to early the plants will be slow to grow and slow to fruit. The best time to plant tomatoes is in late spring when the soil begins to warm up, ideally the soil temperature will reach 16 C. If you plant into warm soils you will get quicker growth and healthier plants. In Melbourne the tradition has been to plant on Melbourne Cup Day, however this does depend on the year and where you live. Soil temperatures will be much cooler in the ranges than in the suburbs. As for varieties, go for taste, Roma and Gross Lisse are proven performers, and many of the heritage varieties are just as easy as the new releases. Although some tomato will naturally have thicker skins than others the most common cause if a combination of heat and lack of water. With water it is regular watering that is the best, it is not much good letting them dry out and then giving them a good soaking. Thick skins can also be an issue when tomatoes are grown in containers, as drying in containers is a regular problem during hot weather. One solution is to use a drip irrigation system or a weeping hose so that moisture is constant.